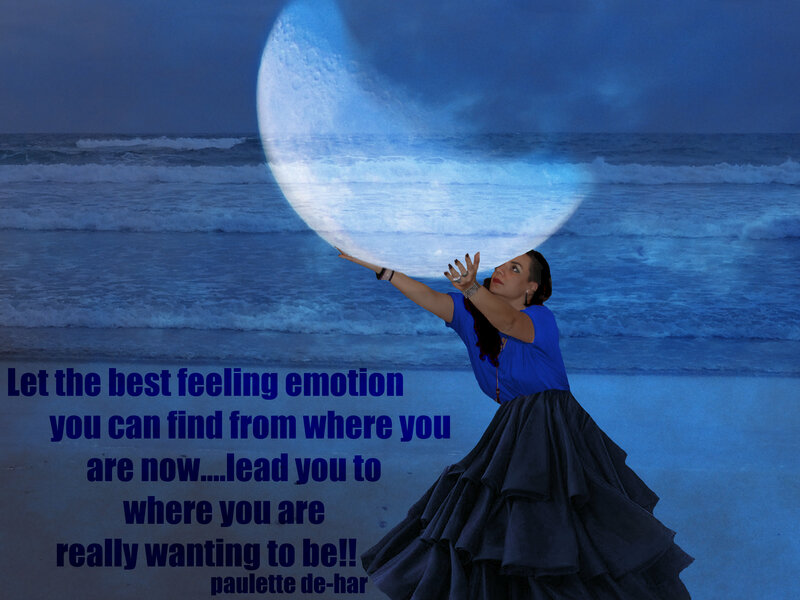 All emotional states….Are a temporary state of being!!! Although this is a truthful statement, as always nothing is completely black or white, but includes many shades of grey especially when it comes to our physical experience on this planet. This statement speaks to the truth that we have control over the emotions we feel as they come in response to the thoughts we think, and when we have mastered the thoughts we will allow ourselves to think through the power of our focused mind, we then have the ability to be the deliberate creator and producer of the emotions we’re wanting to experience rather than purely a reactor to what happens around us with little or no conscious control over what we think and how we feel. As we think any thoughts and hold them in our mind for a short period of time, the Law of Attraction adds power to those thoughts making it much easier for us to think similar thoughts on whatever subject we’re giving our attention to at that moment. The accumulative effect of this over experiences and time is very strong and can be why even when we’re making an effort to improve our thoughts, we easily slip back into the well established vibrational groove (Ooooooh, that’s cool, “Vibrational Groove.” Hehehe….) we’re most commonly at, our General Vibrational Place. Ultimately we do have power over the thoughts we think and how we feel, but when we’re trying to improve our thoughts on a subject we’ve felt a certain way about for a long time, it’s not the easiest and quickest thing in the world to change. It does take time and focus to improve our vibrational place but remember, just as the Law of Attraction added power and momentum to our old thoughts the same will happen with our new thoughts, and once the new thoughts are the strongest vibration within us on whatever subject we’re giving our attention too, they will be the thoughts we have the easiest access too and what we’ll be creating our future experience from, and that’s a very good place to be!!! As we become more aware of how this Universe and the Law of Attraction works, things we may have previously not taken notice of that we prescribed little or no meaning too, start taking on much deeper meanings and we start to recognise and see these signs and what they possible mean for us. They aren’t always good feeling or wanted signs, but they are always what we need to move forward in the direction we’re wanting to go. It’s when we can see all that happens in our experience, both wanted and unwanted as being opportunities for deeper understandings and knowing (especially when dealt with positively) that we’ll be propelled forward and that’s when we start to move into accessing the full power of who we are!!! Every person that comes forward into a physical life knows this, for this knowing is part of what makes us who we really are. If those that surrounded us as we grew up didn’t know and teach us how to focus on what we’re wanting by directing our thoughts and feelings in a positive direction because they themselves didn’t know, we may have experienced temporary memory loss, forgetting that we are the creators of our own life experiences. I say “temporary memory loss” because it’s not possible for anyone to permanently eradicate part of what makes us who we are and it’s only a matter of time before those that have forgotten these truths find themselves on a journey of remembering and discovery. No matter where we are on our journey and how much we’ve come to remember and understand about this life……There’s always more. ~ It’s not a race to see who knows the most. ~ It’s not about declaring ones self to be better than others. ~ It’s about being able to create the life we’re wanting to live and to possibly pass something positive on that we know may help others live more of the life they’re wanting to live….If they’re in the place to receive it of course??? I don’t know about anybody else….But that sounds pretty good to me!!! It’s easy to feel good when good things happen…. Now isn’t that the truth!!! 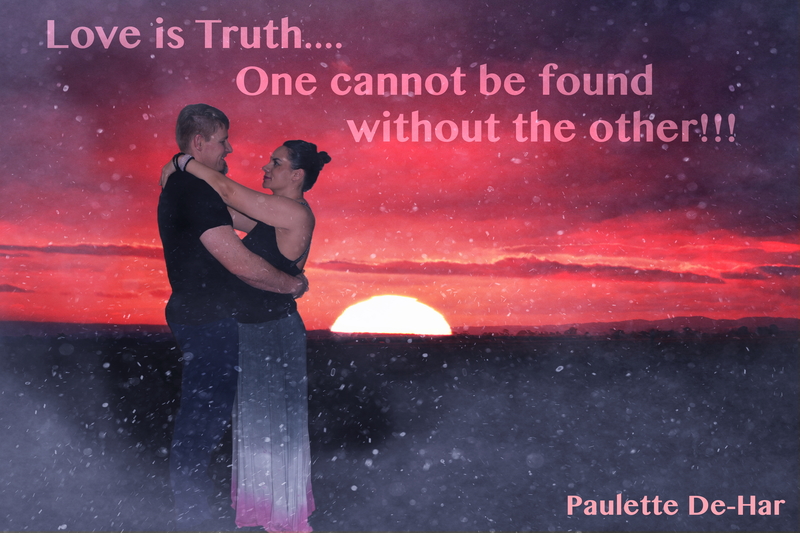 But the trick is, or more to the point, the truth is…. It isn’t just how we react when good things turn up that matters and may determine our future experiences, although this is important. Just as importantly, it’s what we do when things aren’t all going our way that also effects what we may attract into our lives. Our future experiences are created by the length of time we focus, and how much emotional intensity we give any subject. Whether our focus is on something that’s happened in the past, is happening now, or is something we’re imagining that hasn’t yet happened doesn’t matter, it’s the strength of our focus that matters and creates. When unwanted circumstances turn-up, sometimes we’re prone to give them a great amount of focus. This would be good if our focus was directed in a positive good feeling direction on all the good that may come from our experience and possible solutions or changes we may need to put in place to move forward in a more wanted direction. It’s not about pretending we like things we do not, that’s never a good thing as it doesn’t work through negative emotions within us that may be attracting unwanted situations into our experience. Dealing with unwanted circumstances in positive ways means we’re much more likely to move through any emotional resistance we may have to whatever manifested so that similar circumstances don’t turn-up again in the future!!! Now that sounds very good….Don’t you think??? If we’re in a vibrational place that isn’t too far away from this perspective and if we’re feeling generally happy in our lives about many things, it’s not too hard to redirect ourselves into a better feeling place when unwanted circumstances happen. This is because power and momentum is achieved behind how we feel as the Law of Attraction responds to the vibrations we are constantly emitting, and when we focus strongly and positively on anything, whether it’s wanted or unwanted, we release resistance and create even more wanted future experiences. 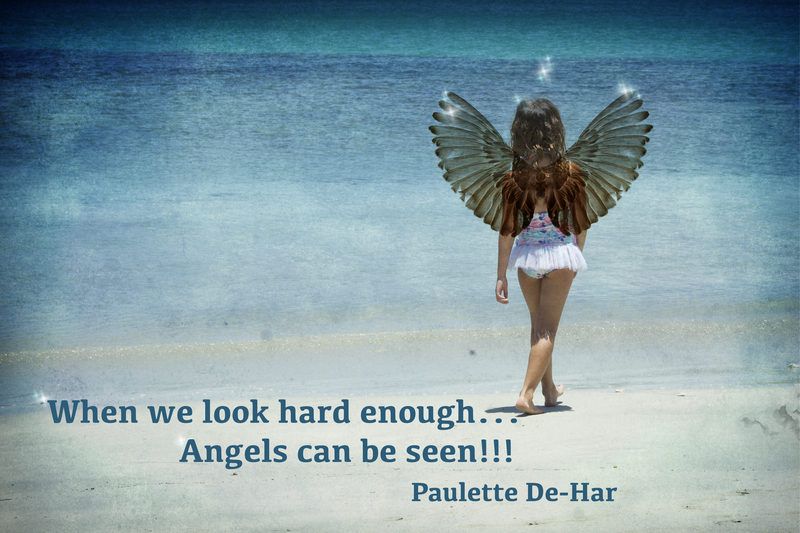 It becomes our normal good feeling vibrational place to go to and be in without having to make too much effort to get there…..And that’s so awesome!!! Once we’ve come to understand how we’re creating our life experiences through our own observation of how we feel and what manifests, it may take some time and effort to move our thoughts and feelings into a better vibrational place if we’ve focused for some time with negative emotional intensity on unwanted circumstances. The good news is…..Once we have an awareness that we’re creating our life it’s not possible to undo this knowing and it’s only a matter of time before we start to exercise the true power that’s within us all. The power to feel good apart from whatever’s happening. The power to focus strongly on the good that’s around us. The power to acknowledge what’s unwanted and move forward positively. The power to create what we’re wanting in our own lives. That is a TRUTH that’s worth believing in!!! So what about previous lives??? Although most have lived many physical lives….When we re-enter the physical realm as a new physical entity, a baby, we often don’t remember the previous life experiences we’ve had. If we do have memories, it’s very often when we are young and aren’t aware that this isn’t an accepted principle or understanding that the majority of people or societies we’ve being brought-up in have an awareness of. Children that are very young have been known to give unusual accounts or details claiming they’ve had experiences or been another person in a different time period and often rely very specific knowledge that doesn’t seem possible for them to have gained at their current young age. This happens more frequently than we may think but is often disregarded as imaginative thinking, or worse….Lying. If we’re coming forward multiple times into different physical lives,(and we are)at different points in time, physical bodies, locations and circumstances without easily accessible memories of any of our previous lives, a reasonable conclusion is that we don’t remember what’s previously happened because we’re wanting differing experiences from different physical perspectives. This wouldn’t be possible if we were to remember the lives and experiences we’ve previously lived. This is no accident, but the way we’ve purposely designed it!!! It would be very difficult to look through new fresh eyes and make different or improved choices if we had clear memories of past experiences from the previous lives we’ve lived. This would mean our current experiences would go through the filter of our previous memories and perspectives. So what would be the purpose of making our transition back to Non-Physical and coming forward into a new body if our perspectives stayed the same??? That being said, we do carry all the experiences we’ve had through all the previous lifetimes we’ve lived within our physical here and now body, and we do have the ability to tap into those experiences and knowledge if we have the desire. For me, although I know I’ve lived many lives before and feel strongly when I meet someone I’ve known in a previous life, I don’t feel the need to find out any specific details or go through the process of trying to bring back those memories. I’m aware that all my previous experiences have led me to where I am now, and any resistance or unfinished issues I may have had in those lives will come forward into the current life I’m living giving me the opportunity to move into a better, non-resistant, vibrational place regarding it, if that’s what I’m wanting. Each life we live gives us a new and different perspective to grow into and experience, and although they are separate journeys, each is closely related to the other. Just as the life we’re currently living is a specific and quantifiable journey, so is the compilation of all the lives we’ve lived a journey with a much broader view and deeper understanding than the individual life we’re living. Our Non-Physical counterpart is communicating that broader understanding to the Physical here and now part of us through our emotions, and depending on how good were feeling, with thoughts too. So when we’re Non-Physical before we decide to take another Physical body, we set general goals or circumstances we may want to achieve in the next life, but by no means are these goals specific or set in stone. More of a general guide that’s open to moving in multiple different ways depending on the direction of our focus, the experiences we have, and the choices we make. The idea that there has been something set in stone by someone outside of ourselves, someone who controls us and then judges us when we don’t behave in an appropriate way or don’t achieve what they’ve set out for us to do, is……Well, that’s more of a human construct. A belief humans hold, not a belief held to by Universal Law or the energy that created and sustains this amazing Universe. So the moral of this rather long story is…..
~There is nothing that has been set down that we have to do in any specific time frame or way. ~We are always on the right path no matter what is happening or manifesting, for all experiences have the ability to move us into more of what we’re wanting. ~No opportunities can be lost because they are continually flowing in our direction, just as one passes, a new one is on it’s way to us. ~There are no wrong choices just challenges to rise too, and better feeling places to reach. ~And, we are all so much greater than most of us have ever imagined…..
Well….If we’re in a place where revenge feels better than where we currently are, the answer would have to be, temporarily, yes….. But one thing is for sure, no matter where we’re sitting emotionally at the time of carrying out such actions, in the long-term, revenge never ever, ever achieves anything we are really wanting to experience in our lives. This is because the Law of Attraction is adding power too and returning too us what we are giving out, whether we are aware of this or not. Don’t worry if you’ve had such thoughts in the past, I don’t think there’s probably many people that have lived that haven’t felt these types of emotions at one point or another. The question isn’t whether we’ve had revengeful thoughts or not, but whether we’ve moved ourselves into a better feeling place before we’ve taken any action against someone therefore creating even more power and momentum behind such thoughts, words and actions that will play out in full physical manifestational form if they are not moved into a better feeling vibrational place. Seeking revenge for something when you feel someone has wronged you is very different to standing up for ones self, and that difference is all about the vibrational place we’re coming from when we carry out whatever actions we feel are necessary for us to come into a better feeling vibrational place. If we want revenge, this always comes from a negative, not good feeling vibrational place. Even if the thought of it does feel good, it’s because the feeling of revenge is sitting in a better feeling place than where we currently are, whereas if we are standing up for ourselves from a positive feeling place, we have usually already found a better feeling place in relation to what has taken place but may still feel like some benefit may come by further discussion. If this is what we are wanting to do, one needs to be very strong and focused about keeping a neutral or positive emotional place and be prepared to leave the situation or conversation if things get heated from the other side otherwise there’s a chance of getting pulled down to someone else’s not good feeling vibrational place and that’s not really ideal. Even if this does happen, it’s not the end of the world because no matter what happens, we have the ability to bring ourselves into a better feeling vibrational place on every and any subject that’s important to us…..But it would also be true to say, it’s easier to bring our thoughts around to a better feeling place before something has physically manifested, because now we have to deal with that manifestation and all the momentum it’s created. Even once something has manifested, we can still improve our thought, it’s just easier to do before it’s a solid reality that’s staring us in the face. 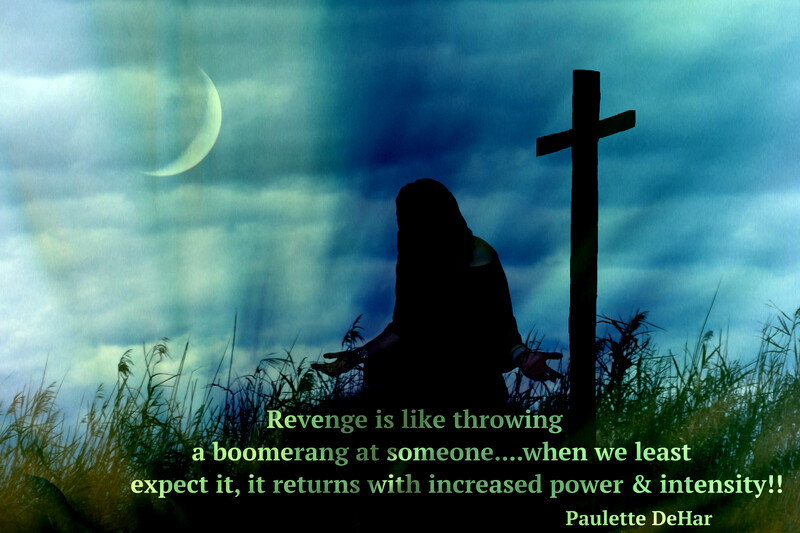 Thoughts of revenge are often fuelled by a desire not to let someone get away with intentionally treating us badly or not nicely, and if actions are taken, it’s often the returning of what has originally been given out, an intention to hurt. The problem with this is, we may be returning what was given out, but in like fashion, we will also be the receivers of what we have given out. None of us can get around the powerful Laws that govern this Universe, and for me it’s enough to know if people are doing such things, even if it’s personally directed towards me, they will be the receivers of their own creations through their thoughts, words and actions…..unless of course, they make an effort to move to a better feeling place, and I hope they do. I know it’s not always easy, but by focusing on not nice things others may be doing and retaliating against them in a negative way means they have succeeded in bringing us to a place where through our own focus on what they have done, we are now in a similar not good feeling vibrational place as them, and for me, that is absolutely unacceptable….. I use all my power and focus to not allow others to have control over how I am feeling. I know I cannot control what others are doing, or who they are currently choosing to be, but there is something I have 100% control over, and that’s myself and how I’m feeling, and I do my best to exercise that power always, but especially when unwanted circumstances arise I feel negative emotion about. So by paying attention to how we are feeling and generally making a relaxed effort to feel better than how we currently are, especially if we’re experiencing negative emotion, as time goes we find ourselves in better and better feeling places with less time spent in the not so good feeling places…..
And that really is something worth feeling great about….Wouldn’t you say!! If you want it bad enough…..You’ll achieve it……Really??? It’s true to say, when we’re in the pursuit of any goal, the more we focus positively, the greater the likelihood of achieving our set goal is, but on the flip side of this equation is, if our focus is negatively driven, even though our desire can be very strong, the likelihood of achieving our wanted outcome is greatly diminished. Intense struggle always promotes more struggle (Remember, Law of Attraction) unless our thoughts are moved into a more positive vibrational place where we believe things have the potential to work out for us…..Even if we aren’t currently knowing how. That’s having true belief and knowing how this Universe works and the power we have to create our own life experiences. 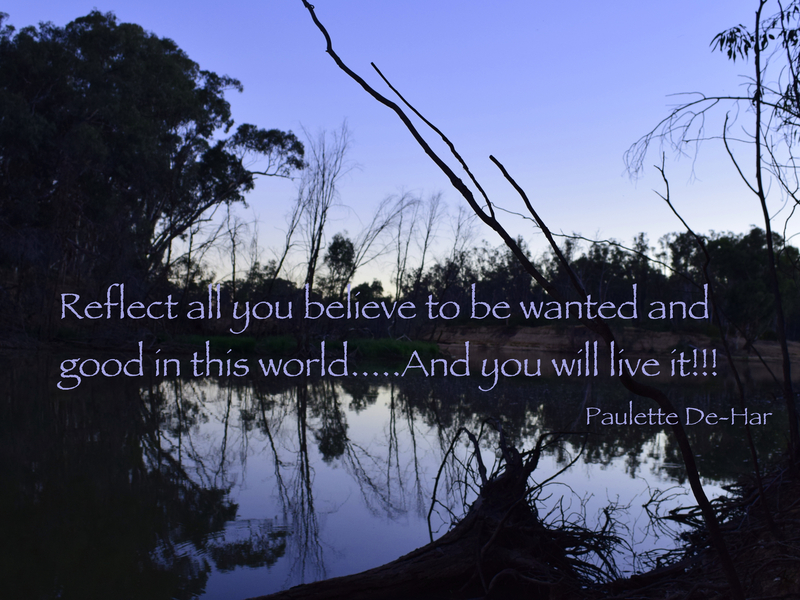 This belief is difficult to produce without knowing how it is we’re creating our life. If we’re not knowing we are the creators of our own experience, and even sometimes when we do know, we may attribute unwanted circumstances that turn up in our lives to outside external forces such as God, the government, or other people, and although there are external forces that do have an effect in our lives because we give these subjects our focused attention, we have control over whether we focus on the positive aspects they bring into our lives or all the not good aspects they may bring into our lives…..And that changes everything about our experience and what we will be attracting because we always get that which we give prolonged focused attention too, with strong emotion, whether they are circumstances we’re wanting or not. If we’ve strived for something for a long time without receiving the results we’re wanting, we probably do need to assess what we’re doing and change something. When we change and hopefully move our thought into a better feeling place, unwanted circumstances often turn up so we can release any negative resistant thoughts we’ve had going on that we may have previously been unaware of. If we are able to work through what has shown itself to us, our own resistance, this moves us closer to the vibrational vicinity we need to be in to allow what we’re wanting to start flowing into our experience, but it does take some time before we may see improved results, especially if we’re highly focused on the end result we’re wanting, for this can prevent us from seeing all the small improvements that are happening along the way. This is often what happens when we achieve what we are wanting but it doesn’t feel that great because we realise our journey was very hard work or a struggle, and it wasn’t fun. There is not one of us alive that does not truly want to achieve what we are wanting in our life, it’s just a matter of how connected we’ve been to our Inner Guidance, the Non-Physical part of ourselves that’s communicating to us through our emotions and if we’ve known what those emotions are indicating. It’s when we come into vibrational alignment, (our good feeling emotional place) where the blending of the Physical and Non-Physcial parts of us takes place, and that’s when much of our struggle ends and gives way to more of what we are really wanting to experience…..And that really is awesome!!! Love is all around us…. Ok, so this was supposed to be a post with just a photo, that’s why I’ve got all that writing on there!!! But then I wrote the post title and found myself not wanting to post it without saying something….Well that’s a surprise isn’t it….Hehehe!! Many would disagree strongly and suggest I live in “Fairy Land” and would explain all the things they may have experienced in their lives or circumstances they may have observed others living that would demonstrate the exact opposite of love….And I agree, the opposite of love exists, with all the shades of emotional greys in-between, it is a great gift. We’ve all come forward with the ability to create our lives through our focused thoughts and feelings, our vibration, and we’re able to create anything we focus on with strong emotion that’s held onto over time. As the Law of Attraction responds to our dominant vibrations, we will eventually experience the full physical manifestation of that focus, whether it is wanted or not. Freewill would not truly be freewill if we only had the option to create positive circumstances in our lives, as it is in Non-Physical, although it does sound great if we’ve been experiencing many unwanted circumstances in our lives through not knowing how we are creating them! The great story of Adam and Eve is an analogy of how we came from Pure Positive Non-Physical Energy, into our Physical environment, (Earth and the Human Body) an environment where polarities exist everywhere, unlike the Non-Physical realm where only Pure Positive Energy resides, a contrasting environment where we can choose either wanted or unwanted through the power of our vibration. It was not a falling from grace that birthed us into this Earthly time-space reality, but a choice of freewill, a powerful choice to come forward with the ability to experience the full spectrum of emotions and circumstances, with guidance from the Non-Physical part of us in the form of our emotions letting us know where we are in relation to all we’ve wanted in this life, and all previous lives for that matter too. Love is in every particle of our Universe, and so is the opposite of it, for this is the only way we can truly know the difference between anything in our experience. For example, if the temperature was warm in every place on this planet….How would you know it was warm without the ability to compare it against hot or cold? A very basic example I know, but I’m sure you can feel the truth of it. And so the same goes for all possible experiences. There is an abundance or lack of everything you can possibly imagine, it’s just a matter of where we place our attention and where we set our general vibrational place that determines what we experience. I know it can be difficult when we have not known this is how we’ve been creating our life experiences, but with Knowledge comes Power…. And whether we have known this for some time or are just coming to understand this now, each and every one of us has the ability to consciously and undeniably move ourselves into a slightly better feeling vibrational place NOW! !